For Thanksgiving we went to my aunt's house on my mom's side of the family and they are Mexican. So instead of all of the traditional Thanksgiving 'meal' we had a combination of mexican food w/ a little turkey, pototoes and stuffing. 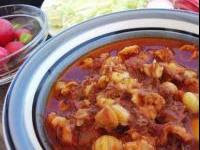 One of the dishes that was prepared was a soup called Posole. For those of you that don't know what it is, it is a broth soup with homony and pork and it is very tasty. Unfortunately I so stuffed from everything else that I didn't have any, but I wanted to share with you this yummy soup that you can make at home to enjoy this winter. 1. Add the pork, hominy, garlic, salt and stock or water to a large pot. Bring to a boil over medium-high heat, and then reduce heat to low and simmer for 1 1/2 to 2 hours, or until the meat is very tender. 2. Remove the pot from heat. Take the pork from pot and set aside to cool. When cool enough to handle, remove the meat from its bones and shred it with your hands. 3. Add the meat back to the pot and simmer for another 10 to 15 minutes. Adjust seasoning and serve with little bowls of your choice of garnishes so each dinner can garnish his or her own serving.